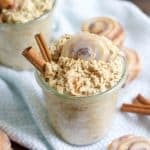 Earlier this week, I mentioned I was on a roll with breakfast recipes, especially overnight oats. I am certain this is my absolute new favorite flavor and I could very well eat this everyday for the next month and maybe longer. There are a few things in this world that I am a sucker for in the food department, and cinnamon and pecans are definitely in the top 5. If you study my recipes for a moment or two, you will easily see this. 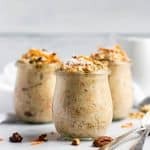 Like I have mentioned before, overnight oats are the greatest for those times when you just don’t have enough time. I like to start at the beginning of the week and toss a few jars of the oats together so they are ready to grab and go. It’s the beginning of a brand new year and we all make those promises to ourselves (some say resolutions, I prefer promises, or really anything else!). We are going to take the time to sit down and have a healthy meal each morning. We are going to leave five minutes earlier so that we are not panicking the entire drive to work. These sort of promises don’t need to make life more complicated. If you just plan ahead, make ahead, and think ahead, this can all be easily done. Start your morning right. Let the day start smooth. Grab a spoon and go! Combine all ingredients in small jar or bowl that can be sealed. Stir well. Refrigerate overnight. Serve heated or cold. I like to eat my warm and usually will add a splash more of milk before I heat them up or I feel the oats dry up a bit. Have you tried adding chia seed to any of your overnight oats? Or eliminating the honey/maple for a little stevia? I will definitely be trying this one and the banana nut bread recipe. Thanks! Hi Crystal! I have definitely used chia seeds in my oats. I usually alternate between flax and chia. If you add chia just add a bit more milk because they absorb a lot more of the liquid. And the maple/honey is to sweeten the oats so stevia could be a great substitute. Stevia is much more sweet so I would start out with a dash and then add to taste. The banana bread oats are my all time favorite! Enjoy! 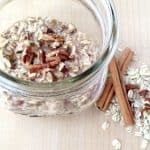 I am new to the overnight oats and am looking for breakfast ideas for the weight loss journey my husband and I have started. Can you tell me why flax or chia seeds are needed? What do they add to the oats? Thank you! Hi Danielle! Flax and chia seeds simply add some protein and fiber. They are certainly not necessary and if you omit them then you should be fine. Overnight oats recipe my obsession so if you have any other questions send them my way. Enjoy!